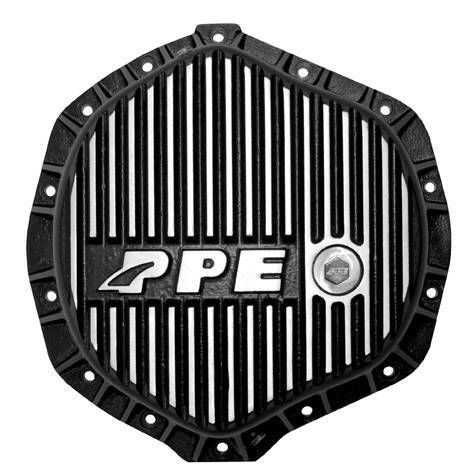 Heavy Duty PPE Differential Cover cast from A356-T6 aluminum alloy. Prolongs life of rear differential gears by reducing oil temperature. Robust side ribs provide additional strength. Fluid capacity increased to 6 quarts. Includes 3/8” NPT stainless steel drain plug and 1” sight level / fill plug with a powerful Neodymium magnet to attract & hold harmful ferrous metals. Easy installation with included fasteners. High quality CMP - 4000 high performance gasket. Dodge Note: This product will only fit on 2013+ Dodge Cummins models with a rear leaf spring suspension. Due to clearance issues, this cover will not fit on rear coil sprung applications.